I have a basically stock 1964 1/2 Mustang 289 automatic coupe, with a generator. Recently when I use my signals the signals, the gas and temperature gauges go dead. Sometimes they come back to life after a few seconds or a few minutes, sometimes not. It seems the longer I run it the worse it is. If I shut the car off and restart it they work again, but only until I use the signal and then they quit again. With the key on accessory the signals seem to be fine. I have tried several different flashers but it doesn't help. 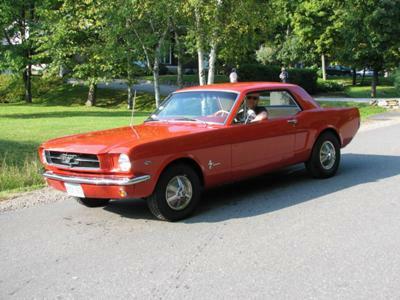 Electrical issues can be a painful experience sometimes, but fortunately your 1964 1/2 Mustang electrical problems can usually be sorted out systematically. First off, my guess would be that the flasher isn't the likely culprit and not just because you have already tried installing new flashers and they didn't fix your Mustang's electrical problems. Also, a flasher is just an off and on switch that opens or completes a circuit. If the flasher works at all, there is power to it and a ground that makes the circuit live. What this sounds like to me, is a short circuit across the some of these wires that makes one of the circuits ground out, when your flashers have power. I think you are on to something when you noticed that the signals and gauges work fine with only the key on. First start from under the dash, remove any electrical tape or wire ties that hold them together and look for issues. If nothing is obvious, then try to separate them where they clumped together and test out your signals and gauges with the engine off and then the engine running. You may find that with the signals turned on, you will wiggle a wire and either see a spark or you wiggle one and find for a moment, that the gauges turn on or off. You'll notice that the fuse box is extremely small and unlike newer vehicles, there are not nearly as many individual systems for say, radio, flasher, running lights, starter, radio and other accessory options. Many of these wires serve power to a number of systems in your car using nothing more than a split off wire from the main high amperage circuits nd that's why they are more likely to cause problems. If this still doesn't find your problem, it's time to grab the wiring diagrams for your car, find the specific wiring that concern these systems and one by one, test them. Important: Make sure you have the wiring diagram for the generator based systems, NOT the alternator wiring, or you will have issues. These are built differently and have wiring that is not evident on a generator system. Even with a genuine Ford Repair Manual, I had difficulty finding the correct wiring information for my generator system. If you have trouble finding them, I'd suggest checking into 1963-1964 Ford Falcon schematics. For the most part, these show the right wiring, but may have slightly different colors for some parts of the system. Good Luck solving your 1964 1/2 Mustang electrical problems. I did finally solve the problem. It was the constant voltage regulator on the back of the speedometer. I can't take credit for the detective work though. I kept digging on the web and found that as a possible cause. It did the trick in my case. Thanks for the input from other contributors.